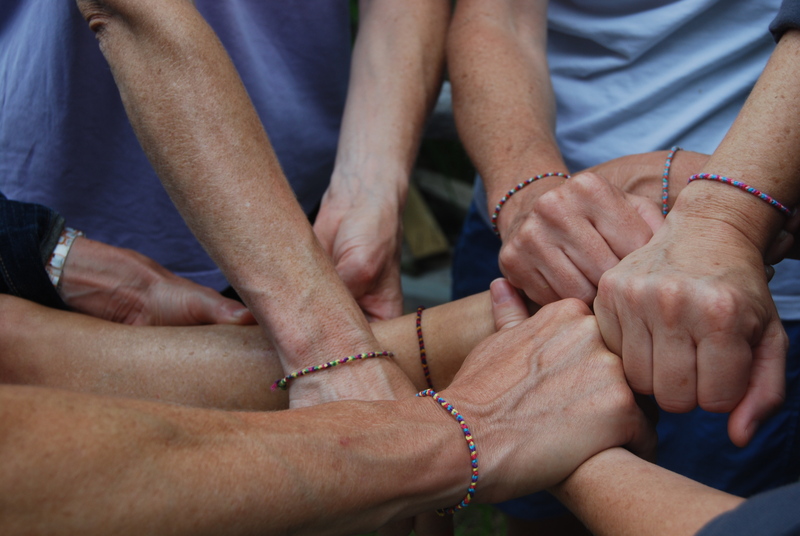 On one Massachusetts girls' weekend, we embraced our inner teenagers and made friendship bracelets. I don’t expect anyone to weep for me, but I am preparing to go away on a girls’ weekend, and it is hell. First, I have to leave the house in relatively good order: laundry done, refrigerator stocked, sports uniforms clean and in easy-to-find locations. (Otherwise I am likely to receive an urgent phone call in the middle of our lunchtime cocktails: “Mom! Where’d you put my shin guards?”) In addition, since I work at home–and girls’ “weekends” traditionally last three or four days–I have to make all sorts of contorted after-school carpooling and child-care arrangements. This requires hiring a series of babysitters and/or baldly asking other people to take my children–something I have grown quite comfortable with. (Hey, I’d do it for them.) Then I have to create “the list,” a comprehensive schedule for all three kids–and the dogs–for the days I am gone. This is left conspicuously on the kitchen table, where it is followed cursorily by my husband and religiously by the babysitters. All this planning leaves me no time to shave my legs or buy something fun to wear. It’s almost not worth going away, I tell you. Almost. My 16-year-old daughter overheard me telling my parents that I was going away with my New Jersey friends for our “annual” girls’ weekend. “And by ‘annual,’ she means monthly!” she piped up in the background. I can understand why it seems that way. 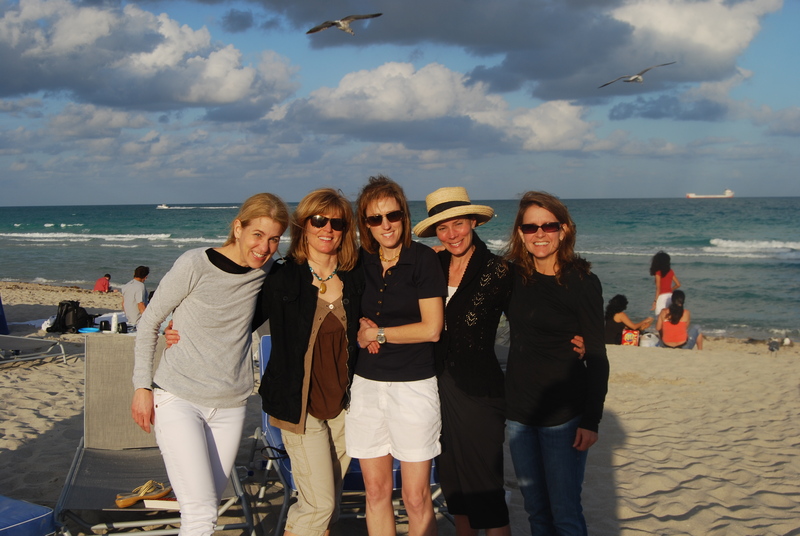 One of the benefits of having relocated as an adult is that I have developed several different groups of friends–all of whom enjoy a good girls’ weekend. The New Jersey gang saw me through my children’s first years with pizza-and-wine playdates and discussions about politics as well as toilet training. The bond forged pushing swings and cutting up chicken fingers remains fierce, even though three of us have moved away from New Jersey; this year will mark our tenth consecutive annual getaway. I have also gained a newer group of Massachusetts friends, who are helping me survive the day-to-day vagaries of adolescence with humor, compassion, empathy and an occasional weekend away. I have had the immense good fortune to have spent girls’ weekends in such delightful places as New York City, Napa, Nantucket, Martha’s Vineyard, Portland, Maine, and Malibu. No matter the group or the destination, every girls’ weekend I’ve ever been on consists of four basic components, set against a backdrop of non-stop gabbing: eating and drinking; running and/or hiking; entertainment (movies, plays, concerts, board games, jigsaw puzzles, etc); and shopping. In the early days, we traveled with breast pumps and made endless phone calls home; now we bring our reading glasses, and are more likely to check in with the kids via Facebook or text. While I secretly cherish this backhanded show of appreciation for all I do, I am beginning to think I’m the one being mocked here. Recently I gathered my family after dinner one evening and warned them that I was leaving early the next morning for New York, so Dad would be in charge of breakfasts/lunches/locating missing homework/packing backpacks/etc. I sat back and waited for the complaining to begin. “I’ll just buy hot lunch,” one of them said agreeably–a sentence previously uttered only when Papa Gino’s was being served. “I’ll pack my own snack,” said another. “I’ll get a ride home from practice,” said the third. “Hey,” I protested. “How come you never do any of that when I’m home? Why are you being so helpful for Dad?” They back-pedaled a little. “Dad doesn’t know how to do anything,” they said. “You just do it better.” They’re no dummies: they know if things run too smoothly in my absence, the enabler might just never come back. This entry was posted in Cranky mommy blogger, Family life, Parenting, Working motherhood and tagged babysitter instructions, girls' weekend, inept husband, leaving the kids. Bookmark the permalink. So true! I loved this one too. Sue you do have a way with words!!!! And that you can tell the true beauty of a women by her hands.